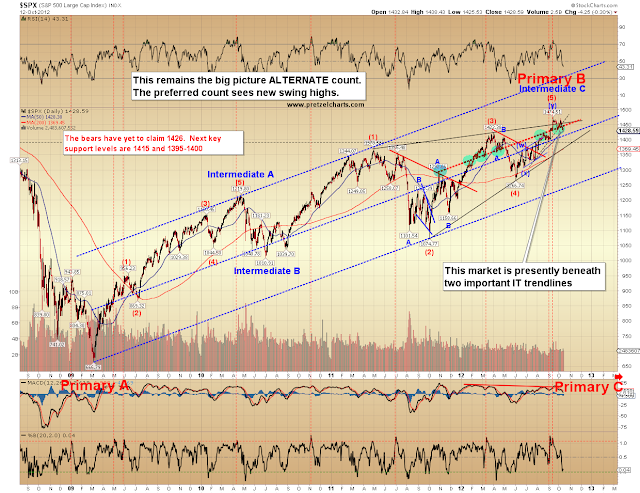 Pretzel Logic's Market Charts and Analysis: SPX and INDU: Market Approaching a Turn? 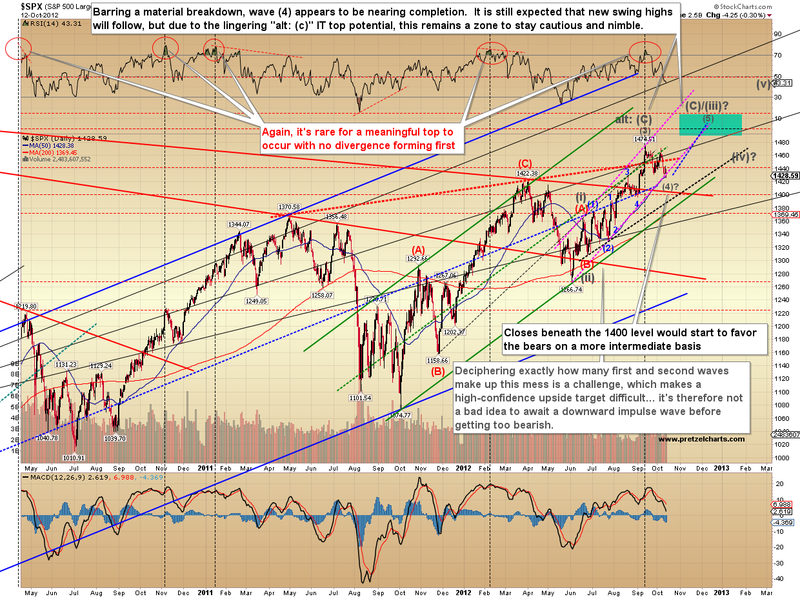 SPX and INDU: Market Approaching a Turn? Friday's update expected further upside to follow after Thursday's expected test of 1425-1430, but the market instead made a slight new low in Friday's session. I suspect the upside was simply delayed a day as the correction became more complex. After studying a number of charts, I believe the odds are good that the market will rally over the short-term, and then reverse back down to make another marginal new low. From there, I currently expect it to reverse back up and make new swing highs. It is possible that a more meaningful bottom is in place already, but the micro wave counts suggest this is slightly less likely (see charts); it is presently expected that the next low will be significant. Below shows the preferred short-term S&P 500 (SPX) path in blue. If for some reason bulls fail to reclaim 1438.43, then all bets are off, and the short-term outcome would be more immediately bearish. 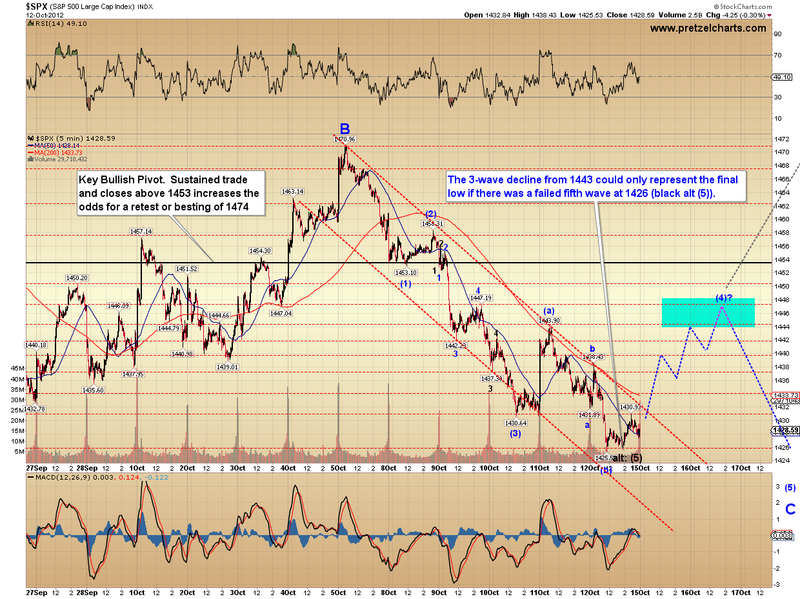 My preferred outlook is that bulls will retake the 1438 level, and 1444-1448 is my current short-term target. Sustained trade above 1453 would suggest the alternate count of a failed fifth at 1426 -- which would mean the bottom is in, and there would be new swing highs directly (see 2nd chart). 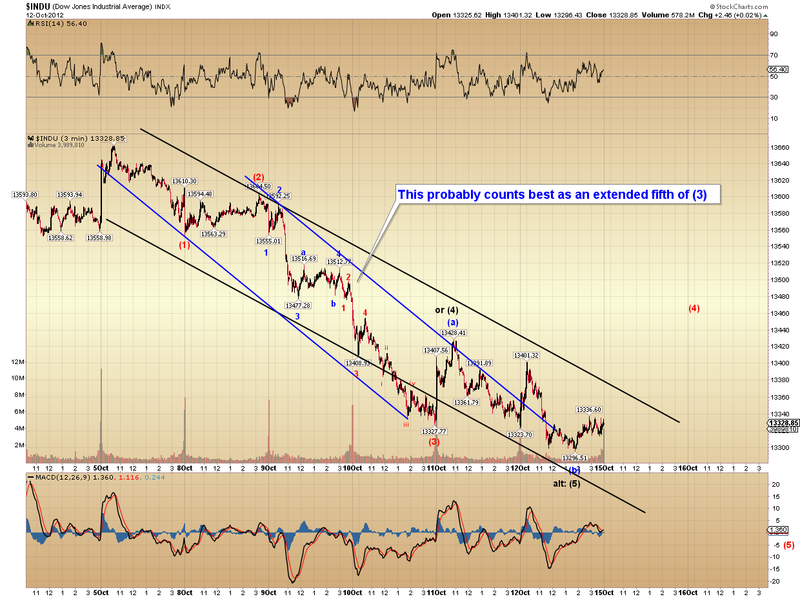 Stepping back a bit, the larger preferred SPX view is shown below. 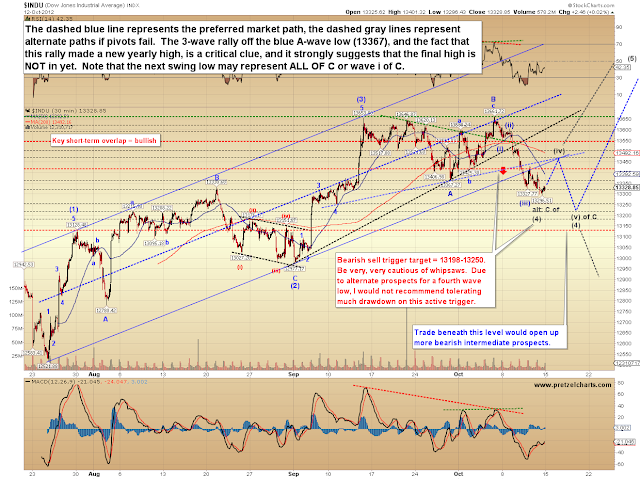 On the Dow Jones Industrials (INDU), I've outlined the preferred path in more exacting detail (below). 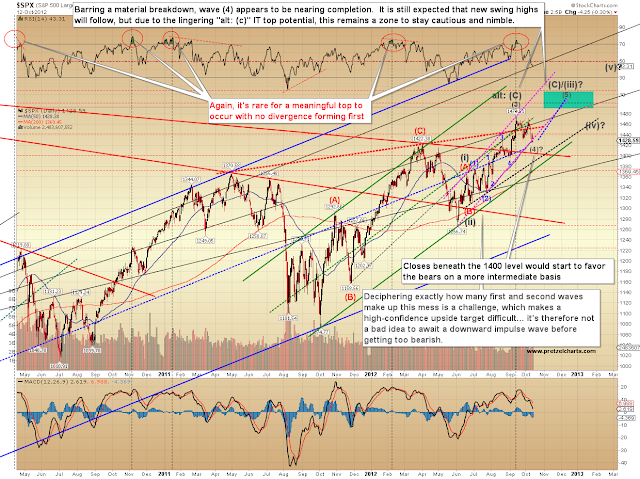 If my micro interpretation of the structure is correct, SPX should follow a similar path. 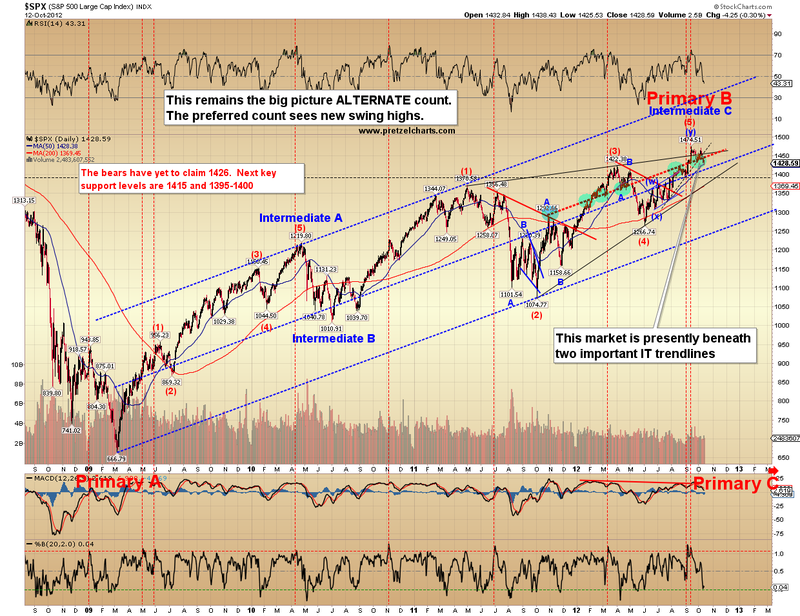 Finally, it's been a while since I've updated the alternate big picture bearish count. This count has refused to die, but bears still need to claim some key support levels, such as 1426, 1415, and 1395-1400, before I'll consider it more seriously. The preferred bullish intermediate potentials are, of course, fully predicated on key support levels holding. 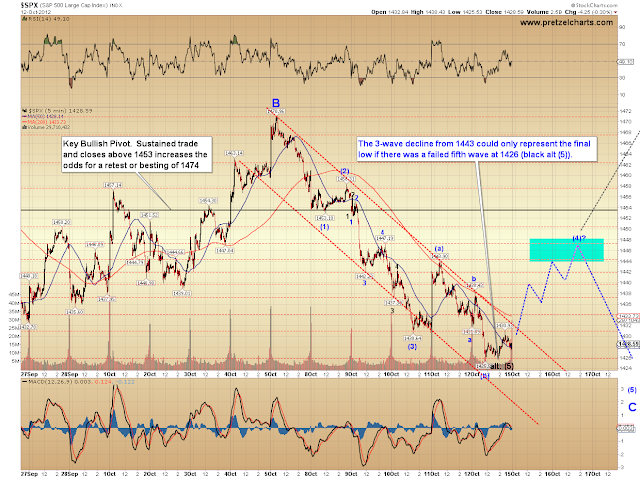 Due to the alternate potential of a wave (C) intermediate top, longs certainly shouldn't throw caution to the wind... but I just can't get away from the momentum at the 1474 peak So, unless bears solidly break through and close beneath support, it still seems unwise to get overly bearish yet. In conclusion, it is expected the week will start off strong, only to reverse to new swing lows in fairly short order (1415-1424 is a nice target) -- and then reverse back up again to new swing highs beyond 1480. Obviously, since this is a pretty exact call that tries to anticipate three decent turns in advance, any distinct change in the wave structure -- or key pivot breaks along the way -- would alter this outlook. 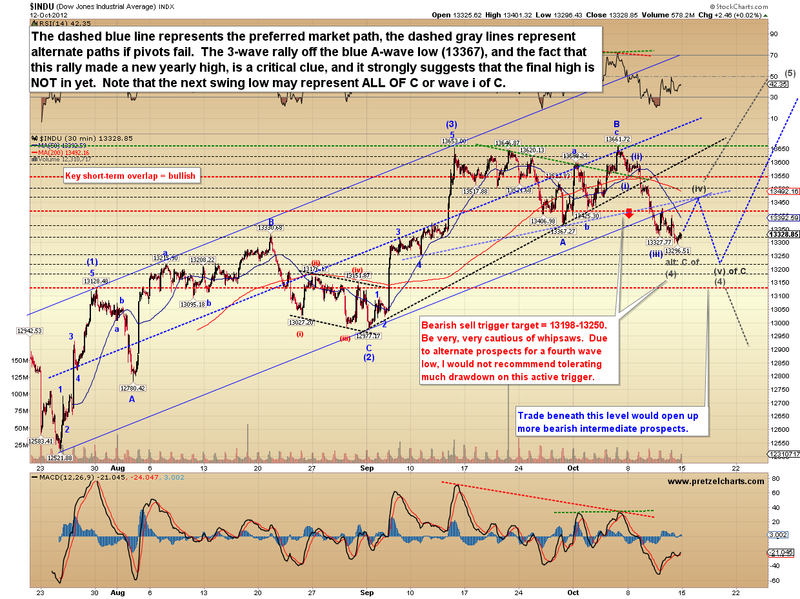 The first alternate count would see the market simply head more or less directly to new swing highs. We'll take a look at things again tomorrow and see how the preferred outlook is tracking. Trade safe. Oct 15 2012, 9:56 AMForgiven1: WHAT!!!! Oct 15 2012, 9:56 AMForgiven1: I did not know they banned you. Oct 15 2012, 9:57 AMForgiven1: I just ignored him because I cant read as fast as he appears to read. Oct 15 2012, 9:59 AMForgiven1: I got to go to work, see everyone later. Oct 15 2012, 10:30 AMCuriousmind: hye K7 other than arr, what is the other income stock that starts with A you were talking about? Oct 15 2012, 10:31 AMfrannybrd: Still trying to figure out where we are in a pattern. Welcome to my new Chatroll! I am amazed to read below, that katzo7 has left your site, permanently. what did you do to him, fool? because without him, you are nothing. just a bunch of chickens running around, with their heads cut off. despite you previously being (wrong) a staunch mega-bear, over last 2 years. to me, your personality is looking very much, like a top --contrary-- indicator. so now, you are big bullish? then, I'll be big bearish. and viceversa. goodbye. what a waste of time you are, hawaii dude. hope they kick you out of minyanville, asap. anyway, now you don't even let onlookers read the mad ramblings, of your stooge 'donators'.